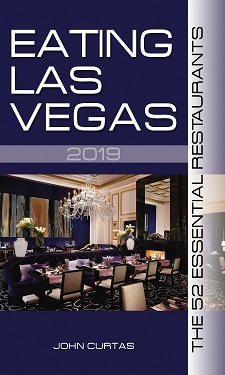 Everyone these days is talking about downtown’s chef-driven cuisine at Esther’s Kitchen, Flock & Fowl, The Kitchen at Atomic, Jammyland, 7th & Carson, eat. and Carson Kitchen. Heck, they’re even talking about the resurgence of Pop Up Pizza in the Plaza….which does some superb deck oven work that rivals Good Pie for downtown pizza hegemony. We’re talking Puerto Rican food, folks. 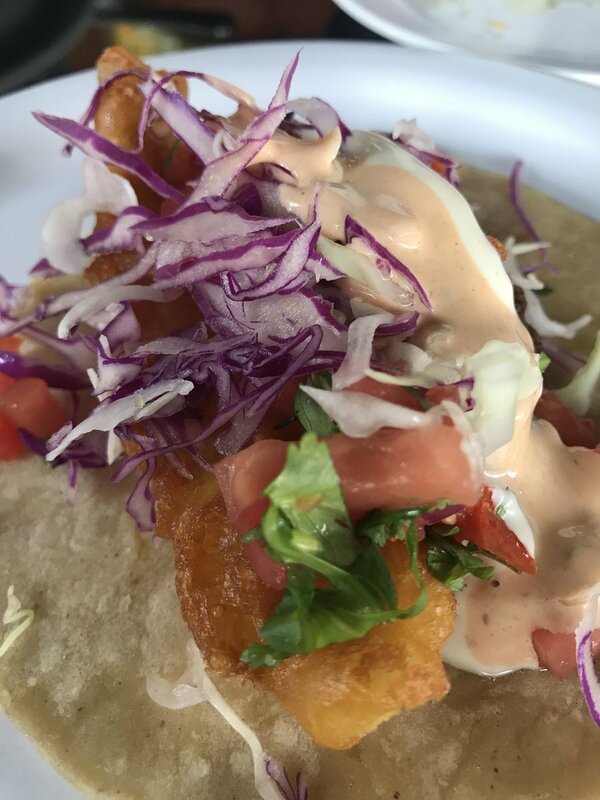 And fish tacos. Two versions of Latino-inspired cuisine that provide a whole lot of satisfaction for relatively little bucks. You’ll notice those shrimp are sizeable and de-veined, and the plantains were fried to a fare-thee-well. ….was packed with flavor and obviously turned out by someone with real pride in this cuisine. The Food Gal® and I ordered way too much, (and spent around $50) but everything from the sandwich to the coconut flan was a treat — so good it’s even worth standing up to eat. 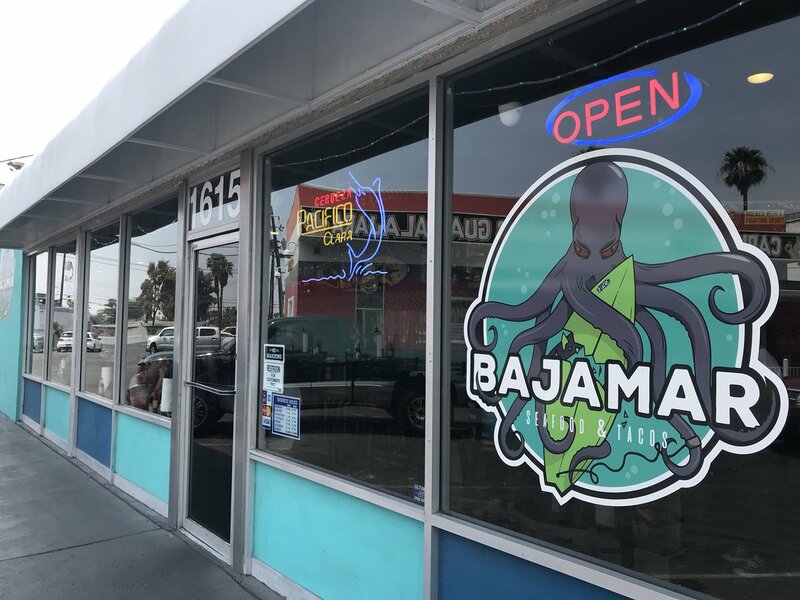 Literally right across the street from Puerto Rico Express is Bajamar Seafood & Tacos — another place so surprisingly good you’re going to kick yourself for not coming here sooner. Having been burned by flaccid fish tacos for like….forever….I approached Bajamar feebly. It occupies a space previously occupied by one failed food operator after another, sits within the shadow of the shuttered Olympic Garden, and shares a parking lot with some forgettable slinger of Mexican mediocrity. In other words, you couldn’t have a less auspicious location for the real deal in fish tacos. 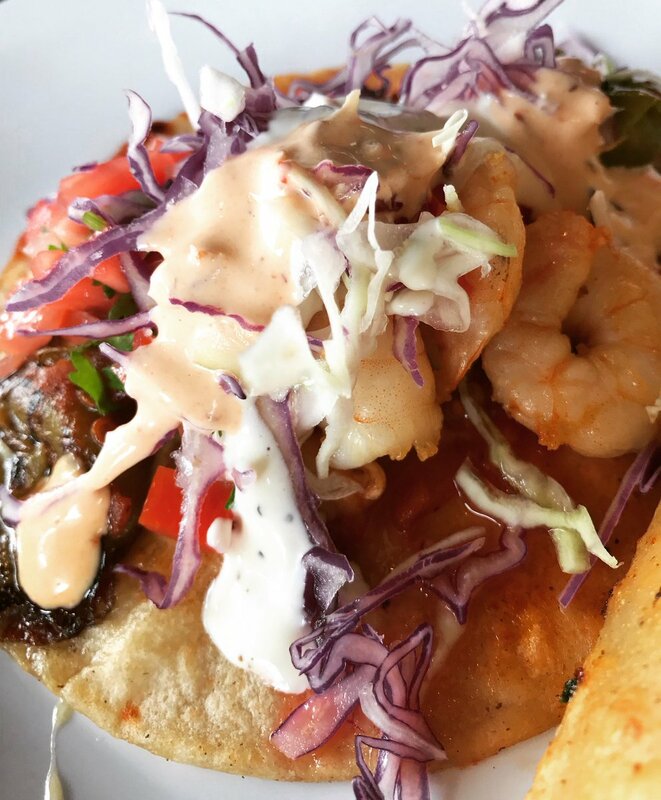 ….these tacos announce themselves as the actual Ensenada enchilada — the best fish tacos Las Vegas has ever seen. ….that will light you up and turn you on like no ceviche, ever. We even like the little, house-made cheesecake they do for dessert here, and people tell us the battered and deep-fried fish and octopus chunks (pulpo on the menu) are not to be missed, either. Downtown dining has gone decidedly upscale in the past three years, but amidst all the porchetta and pasta, and the inundation of craft cocktails and bohemian beers, it’s nice to know that some solid lower-end, food-centric joints have opened to satiate cravings at all price points. Which is just what a legitimate urban food culture needs. Um, you do know that Roberto Clemente was Dominican and not Boriquan, right? Good work.. I’m glad you are back in the game. I’ve been tempted check out both of these spots out for a while. Thank you.